Performing magnetization studies on individual nanoparticles is a highly demanding task, especially when measurements need to be carried out under large sweeping magnetic ﬁelds or variable temperature. Yet, characterization under varying ambient conditions is paramount in order to fully understand the magnetic behavior of these objects, e.g., the formation of nonuniform states or the mechanisms leading to magnetization reversal and thermal stability. This, in turn, is necessary for the integration of magnetic nanoparticles and nanowires into useful devices, e.g., spin-valves, racetrack memories, or magnetic tip probes. Here, we show that nanosuperconducting quantum interference devices based on high critical temperature superconductors are particularly well suited for this task. 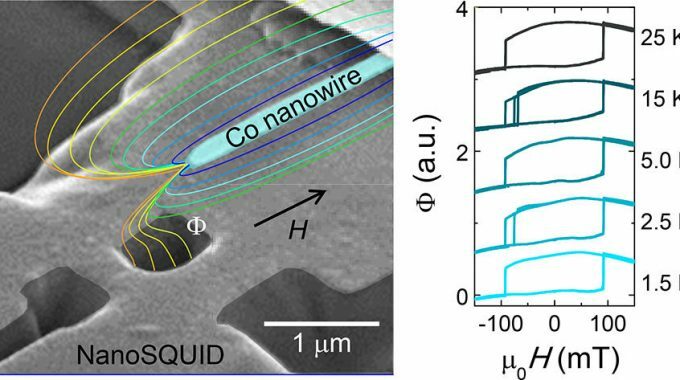 We have successfully characterized a number of individual Co nanowires grown through focused electron beam induced deposition and subsequently annealed at diﬀerent temperatures. Magnetization measurements performed under sweeping magnetic ﬁelds (up to ∼100 mT) and variable temperature (1.4−80 K) underscore the intrinsic structural and chemical diﬀerences between these nanowires. These point to signiﬁcant changes in the crystalline structure and the resulting eﬀective magnetic anisotropy of the nanowires, and to the nucleation and subsequent vanishing of antiferromagnetic species within the nanowires annealed at diﬀerent temperatures.